Westfield Football Club’s goalkeeper is away with the Jamaica under-23 squad. 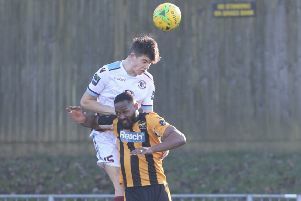 Tristan Da Costa played for Westfield against Northiam 75 last weekend before flying out to the Caribbean on Tuesday for a national camp with the island’s under-23 squad. Da Costa, who has been with Westfield since November, is from Canada but qualifies for Jamaica through a parent. Without Da Costa, Westfield will travel to still unbeaten Rustington in Southern Combination League Division Two this coming Saturday. Just what Westfield will turn up is anyone’s guess having beaten another high-flying team, Angmering Seniors, a fortnight ago only to lose against lower grade Northiam seven days later. “We’re so Jekyll and Hyde,” said Westfield chairman Jack Stapley. “We’ll turn up this week with a completely different attitude and I wouldn’t put it past us to get a result. We just seem to raise our game a bit when we’re playing against the better sides. “It’s something that’s become a habit I think. We’ve always struggled against lower grade opposition, whereas against higher opposition we always seem to give them a game and nick a result here and there. Second-placed Rustington trail leaders Roffey on goal difference having played six fewer matches. Sussex Intermediate Challenge Cup semi-finalists Rustington have won 13 and drawn two of their 15 league encounters so far.